I didn’t really get this watch at first. As we conventionally understand the term, one is said to have been afflicted with the evil eye if one experiences an unmitigated and inexplicable stretch of misfortune, suffering and illness. It’s more or less like a kind of jinx. 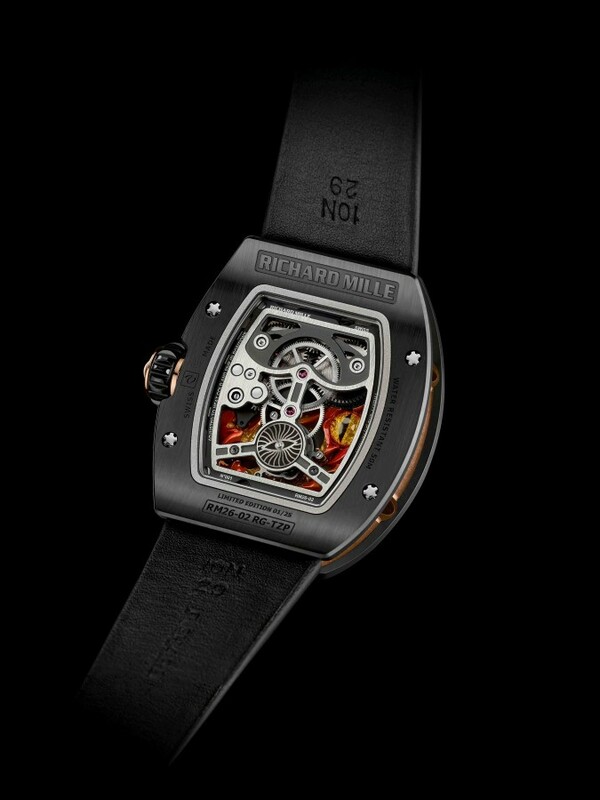 The way I saw it, there didn’t seem to be a whole lot of connection between owning a Richard Mille tourbillon timepiece and being struck by exceptionally bad luck. In fact, you’d probably assume the complete opposite; that the ownership of a Richard Mille timepiece is indicative of a pretty good life. This is before I looked up the traditional cultural meaning and beliefs behind the evil-eye phenomenon and the watch actually started to make a bunch of sense. You see — despite its name, the evil eye doesn’t have to involve an actual curse or malevolent intent. The direct cause of the bad luck is supposedly the supernatural attention that was brought upon the afflicted person by an envied attribute or possession. For instance, lots of cultures are still superstitious about over-praising or lavishing excessive affection upon babies in case this attracts the unwanted scrutiny of the (pretty vindictive, it seems) powers that be, or hovering spirits of ill disposition, who might just decide to even out the score by making the cherished baby sick. There is a whole industry of folk talismans built up around trying to deflect or dissipate the eldritch energies of the evil eye, and plenty of them centre on the iconography of an eye. I guess you need one eye to combat another, or something. Folk talismans are not exactly known for their robust scientific logic. Mediterranean fishing boats often have eyes painted on their prows for this purpose. In Turkey, beads or other personal accessories decorated with concentric circles representing an eye are worn to shield the bearer against malicious influences. The hamsa is a charm in the shape of a hand with an eye embedded in its palm that is commonly seen scattered throughout the Middle East and North Africa, based on this folk belief. When you look at the RM 26-02 Tourbillon Evil Eye in this context, the rationale behind the watch becomes a whole lot clearer. 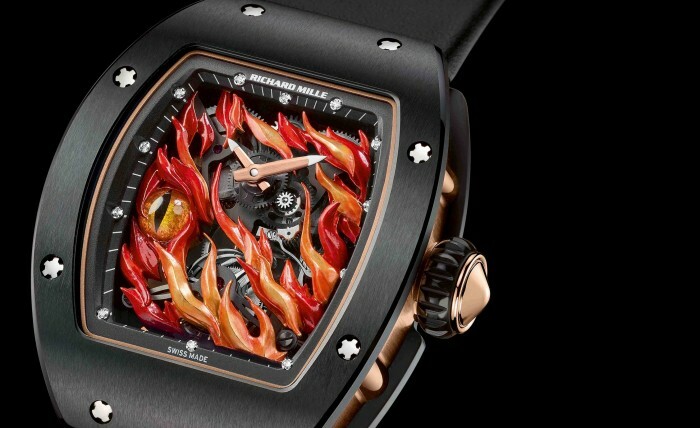 The wearer of the RM 26-02 Tourbillon Evil Eye, if he or she pursues similar aesthetic principles in luxury consumption — bold designs, unmistakeable symbols of wealth and power, strength and refusal to compromise — will need to go to some lengths to avoid the outpourings of envy that accompany such external accoutrements of affluence. Best to keep the watch on at all times, then. In times of economic uncertainty, and in an era of political demagoguery that plays on the symbolism of wealth as societal malady, the RM 26-02 Tourbillon Evil Eye carries a potent symbol of its own. Even if you don’t subscribe to the whole ethos of a nebulous karmic nemesis engendered by envy of luxury lifestyles, you can’t really say no to a continual (and well crafted, when it comes to that!) reminder not to let toxic perspectives leach into your enjoyment of a good watch. 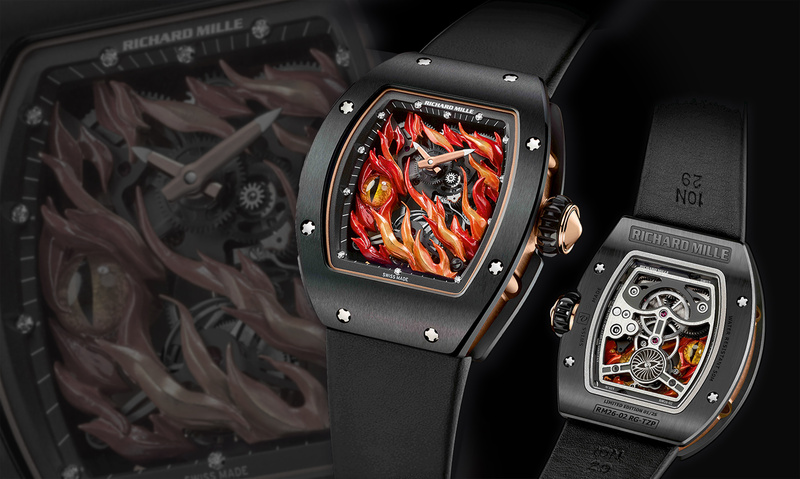 The serpentine, slitted enamel eye of the Richard Mille RM 26-02 Tourbillon Evil Eye is nestled in a bed of lacquered gold flames, and glares out of the watch with towering fury. Woe to the malignant stares that come slicing in its direction. Layering symbolism with material properties, the eye itself is executed in enamel, which is known for keeping its radiant colour and vibrancy throughout the centuries, and it is also positioned at eight o’clock, with eight representing the concepts of eternity and unbroken time. Infinite protection, how about that? Don’t forget also the almost fanatical devotion in many Asian cultures to the number eight, as its pronunciation makes it a homophone with the word for “prosper”. There’s not much else you can better counter a waft of malediction with than extra lashings of prosperity! A second enamelled eye peeks out from the top of the movement, as seen through the transparent caseback of the watch, and a third and final eye adorns the bottom of the tourbillon carriage. Three eyes may or may not mean three times the protection — I don’t think these things are subject to arithmetic progression, but there’s something to be said about the fact that the watch wraps around your wrist, where your pulse is closest to the skin’s surface, and is by extension also most vulnerable. 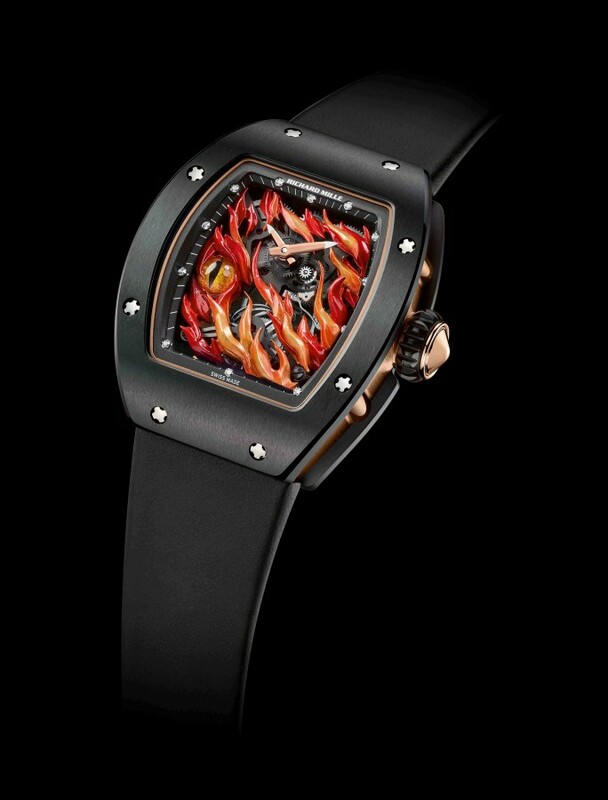 The whole thing is cased up in gold and super-hard tetragonal polycrystalline zirconia ceramic. I guess that means you’re pretty safe with this one.